Poker Superstars III is rated 3.3 out of 5 by 9. Rated 5 out of 5 by 117jeter from Ronald one of the best poker games every. Rated 4 out of 5 by LuCaniCo from Pokler superstars 3 a game with ups and downs, but most facionating. Rated 3 out of 5 by Shabry_808 from Personality Issues? 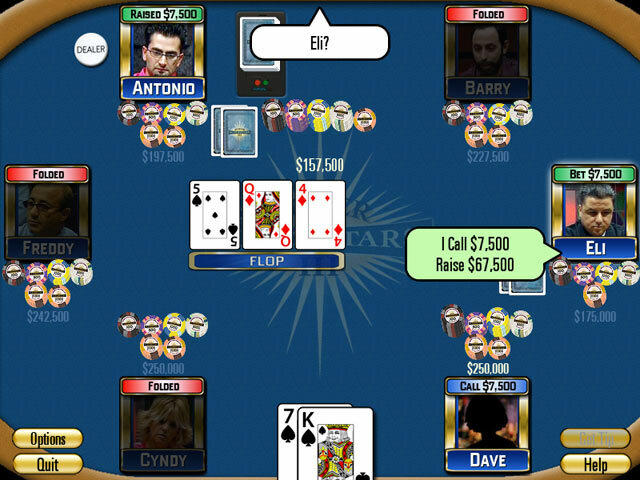 Several of the Avatars have got real personality issues and won't allow a real poker game to go on once they get even a low pair or Ace in their hand. Why do they always have to go "All In" with an Ace-high? Sometimes the Avatar for the females ONLY bet Aces (especially the one whose name is misspelled!!! ), and always raise all the way with only an Ace-high, which doesn't seem realistic to me. WHY?!? 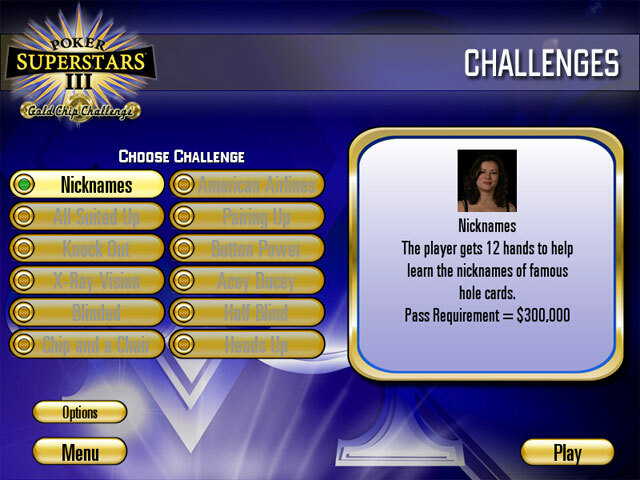 Rated 1 out of 5 by marlidia from If you are looking for the ANTIPOKER... this is the game! Please never ever ever play poker as is played on this game. It has nothing to do with poker. The blinds are extremely high, the level of game extremely low... (get pocket pair Js or better, and you will find out what I am talking about)... someone with 23 off will win no matter what. Governor of Poker is 1000 times better! Rated 1 out of 5 by JJGamePlay from Don't Bother! I don't expect to win all the time, but this game is insane! You can get a really good hand and your opponent will almost always have better. When you finally do get a good hand, everybody else folds and then you end up folding the next 15 hands because it keeps dealing you nothing. Example: I had an Ace high straight and my opponent had the same except his was a Royal Flush! Unbelievable! Good Luck!